For many consumers, being contacted by a bank about potential fraud is far from a pleasurable experience—however it is important to note that it can be, but only if managed in a timely, personalized manner. As a matter of fact, it has been discovered that there is a consistent “golden moment” that resides within the fraud intervention—but how is it leveraged? 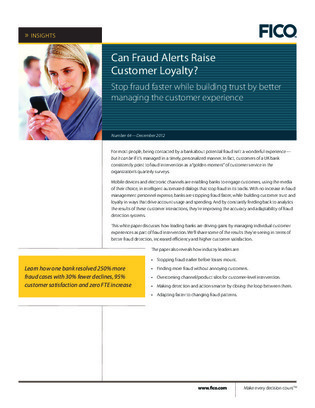 The following white paper discusses how leading banks are driving gains by managing individual customer experiences as part of fraud intervention. Learn about the results these banks are seeing in terms of better fraud protection, improved efficiency, and higher customer satisfaction.